Scott Easterlow was in no mood for excuses after his side's FA Vase exit at the hands of Wellington Amateurs. Racing Club Warwick boss Scott Easterlow pulled no punches after his side were dumped out of the FA Vase by Step 7 outfit Wellington Amateurs, labelling it “the worst showing since I have been at the club”. On a day when Wellington marked the passing of their chairman Dave Gregory, Racing Club found themselves two down inside the first three minutes in Telford. They rallied to go in at the break level and, having seen their hosts reduced to ten men, took the lead after the interval through Wade Malley. However, Racers were wasteful in possession and allowed Wellington back into the game, with Matt Elsmore going on to score a hat-trick as the visitors were well and truly beaten. “Easily the worse showing since I have been at the club,” admitted Easterlow. “ We had a fair few lads missing but that’s no excuse. “We had enough out there to a get a result. “It was one of those days when I couldn’t believe my eyes. “Only two players came off the pitch at the end with any credibility. “If we had conceded six good goals you can say ‘look they deserved it’ but at least four of the goals they scored were basic errors from us. “Credit where credit is due to Wellington, they ran their hearts out and that’s something we didn’t do. “I keep stressing to my lads first and foremost you have to be willing to work harder than anyone, else you might as well not turn up. Early goals from Steve Faux and Marc Perry sparked Racing Club into life and Ben Mackey turned well to fire home before Jamie Tank produced a fine volleyed equaliser. 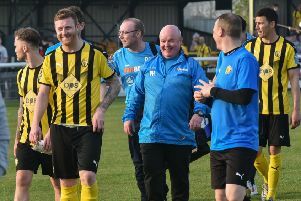 Perry was then red-carded for kicking out at Martin Slevin on the floor, while Sam Beesley was taken to hospital after sustaining a nasty cut to the head, Ross Quartermaine replacing him. Wade Malley scored an acrobatic third for Racing Club to put them ahead but despite the visitors dominating possession, they were unable to put the game to bed. Faux smashed home his second before Elsmore nodded home after Faux had struck the bar. Elsmore cut inside to double his tally and then completed his hat-trick on the break and Easterlow said the opportunity to erase the memories of Saturday could not come soon enough. “It’s going to be a long week until we get chance to put it right on Saturday (at home to Coventry Copsewood).